In an interview with reporters, Zubeidat Tsarnaev, the mother of Boston bombing suspects Tamerlan and Dzhokhar Tsarnaev, insists her sons are not responsible for the Patriot Day attacks and expresses her regret in relocating the family to the U.S.
MAKHACHKALA, Russia — The mother of the Boston Marathon bombing suspects insisted Thursday that her sons are not responsible for the attack and said she did not see any aggression in the older brother, even when the FBI questioned him two years ago. Speaking to reporters in Russia, Zubeidat Tsarnaeva also said the elder son, Tamerlan Tsarnaev, came to Russia for six months last year to attend a family wedding, visit relatives and later renew his Kyrgyzstan passport. 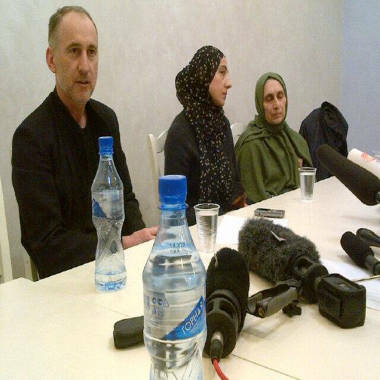 Left to right, Anzar Tsarnaev, the father of the Boston suspects; Zubeidat Tsarnaev, their mother; and Maret Tsarnaev, their aunt, hold a press conference. U.S. investigators have said they want to know more about why Tamerlan Tsarnaev was in Russia. When he returned to the United States in July, he began posting radical Islamic videos to his YouTube account. Russia twice asked the United States for more information about Tamerlan Tsarnaev in 2011, investigators say, but the FBI found no sign of terrorist activity, and Russia failed to provide more information about why they were concerned about him. In her press conference, the mother said that the younger and surviving brother, Dzhokhar, has not been questioned by investigators. She said that the brothers have not been identified as suspects by the U.S. authorities, only by reporters. Both assertions have been directly contradicted by investigators. Tsarnaeva also said that the elder son, who investigators say was killed after a shootout with police early Friday, was alive longer than official accounts suggest. Tsarnaeva, a naturalized American citizen, said that she is considering renouncing her citizenship. She evaded a question about traveling to the United States. Her husband, Anzor Tsarnaev, said he planned to leave later Thursday but did not have a ticket. The family came to the United States on an asylum petition a decade ago, and the parents have since returned to Russia. The mother suggested Thursday she regrets coming to the United States. Dzhokhar Tsarnaev is in fair condition at a Boston hospital. Investigators say he told them the brothers acted alone and set off the bombs, which killed three people and injured more than 200 on April 15, to defend Islam after the Afghanistan and Iraq wars. The parents said Tamerlan Tsarnaev had not discussed the wars with them. On Thursday, 31 marathon victims were still in the hospital, one in critical condition. Family members believe Boston bombing suspect, Tamerlan Tsarnaev, was brainwashed into following a strict strain of Islam by a friend, causing him to drop out of school and quit boxing to become more devout. NBC's Jeff Rossen reports. What did the FBI and CIA know and when?